The final community reveal from The Boomsday Project is over, meaning the expansion is now in the home stretch. The set will bring 135 new cards to Hearthstone in just six days, with 72 yet to be revealed. Those will be unveiled between tonight, via a final livestream and some final card reveals from Blizzard. 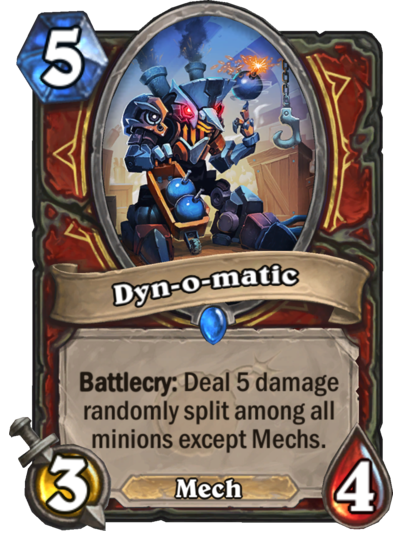 Dyn-o-matic is a five mana 3/4 Warrior Mech minion. When it's played it deals five damage to all minions, including friendly ones—except Mechs. Those are safe. With nearly half the set still to show, it's hard to say for certain what cards could make the cut in a Mech deck. Certainly this is not as good as Duskbreaker, a similar removal card. Also if Mechs are popular, this becomes a worse card to put in your Mech deck.